The Apalachicola-Chattahoochee-Flint Stakeholders was recognized Thursday by a state group for providing a "road map" to end the tri-state water wars. The ACF Stakeholders was one of 13 groups honored as the Georgia Clean Water Coalition released its "Clean 13 for 2018." The report highlights individuals, businesses, industries, non-profit organizations and governmental agencies whose extraordinary efforts have led to cleaner water in Georgia. 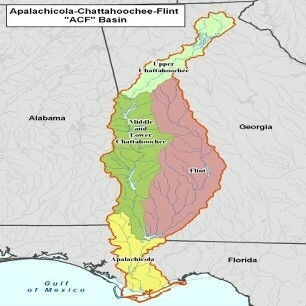 Regarding the work of the ACF Stakeholders, the GWC says "as Georgia continues court battles with Florida and Alabama over the equitable use of water shared between the states, the work of the Apalachicola Chattahoochee Flint Stakeholders has provided a roadmap for ending the litigation and creating a plan that protects the rivers and their many users." A U.S. Supreme Court ruling earlier this summer gives Florida another chance to make its case against Georgia in the long-running dispute. Likewise, in Carrollton, Southwire, a world leader in the production of wire and cable, now uses collected rainwater at its manufacturing facility. The company’s 5-million gallon stormwater collection system has the added benefit of protecting a nearby creek. Together, the efforts of these “Clean 13” are adding up to cleaner rivers, stronger communities and a more sustainable future for Georgia, the GWC says. Click here to read the full 2018 report.